Enjoy looking at your TV even when it’s switched off. Many lounges are cluttered with remotes, CDs, Blu-rays, pay TV boxes, game consoles and wires. 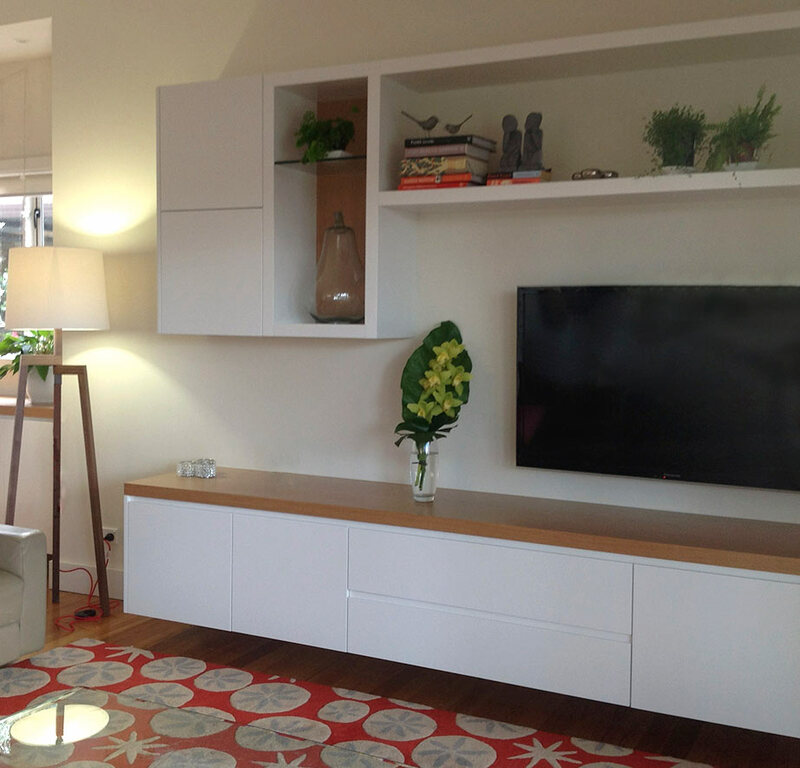 De-clutter with a custom made TV and media storage solution that leaves you to just sit back and relax! 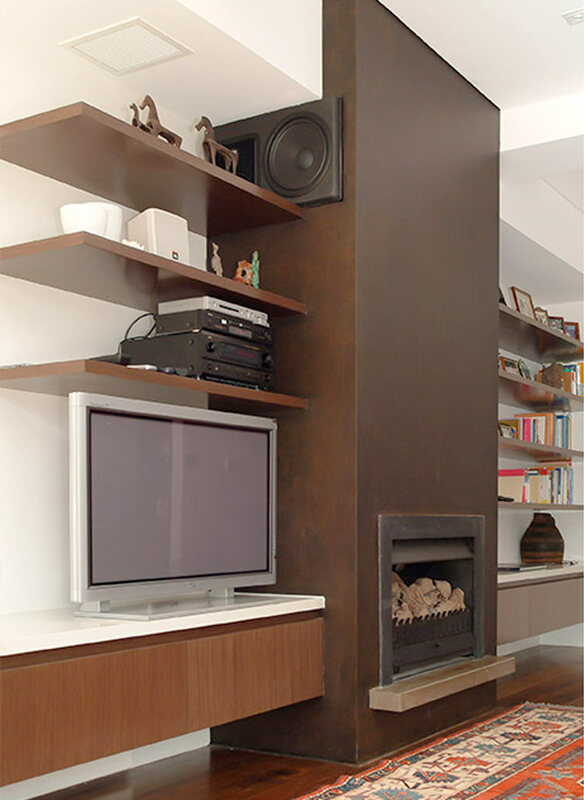 Enjoying time out in front of the TV makes your media unit space a popular part of the home. So why not make it look great too? Hide those unsightly cords and mismatched pieces of equipment in a high-quality media storage system. 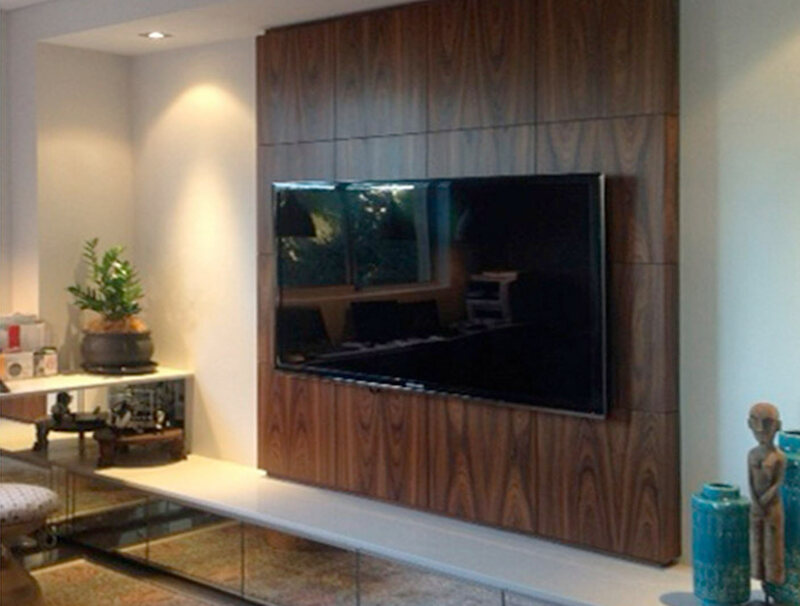 We’re up with the latest trends so you can expect an aesthetically pleasing and functional design for your modern contemporary entertainment wall unit. 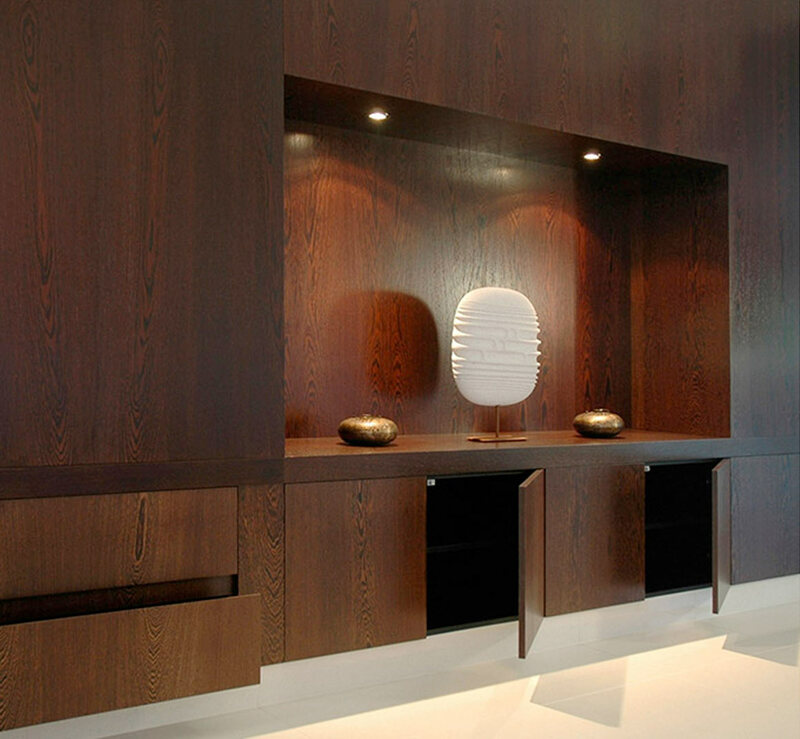 Choose from our wide range of quality finishes, to ensure your satisfaction with the finished product. 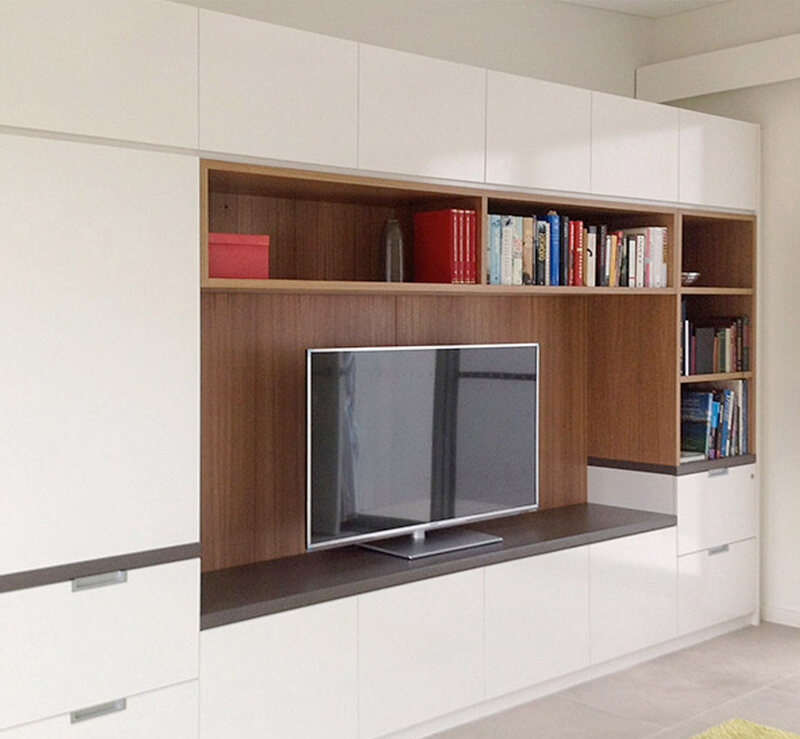 "A huge thank you to your team for the planning and install of our media unit and bookcases. Your designer was absolutely lovely to work with and designed everything perfectly. The installers were so professional and the lovely result is thanks to their high standard of workmanship! It isn't often we get such excellent tradespeople." Love your furniture so much you want to take it with you when you move? Done! We can design a freestanding masterpiece, a built in entertainment unit, a wall hung entertainment unit, or floating wall unit, whatever suits your lifestyle and budget. 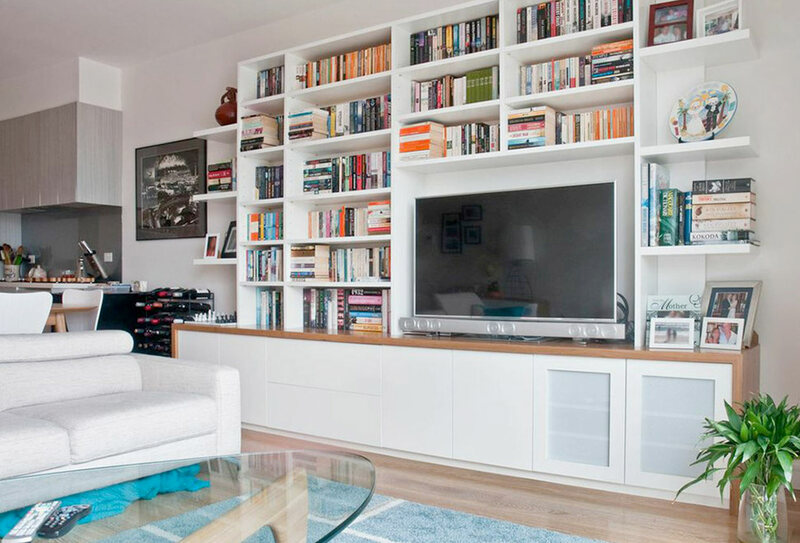 Our stylish designs not only include space for media equipment, remote controls, cable access and ventilation but can display your beloved ornaments, vases and books for the most functional and attractive solution. If you want to buy entertainment units, rest assured that we organise everything for you, all you have to do is say the word "go"! Our team of skilled designers meet with you in your home to learn more about the specifics of your custom made wall unit project. Let’s talk “design through to installation”, you’re sure to be impressed! These days, our televisions are sleek, stylish and light enough to mount on the wall or sit on floating entertainment units. On top of this, we no longer need to keep lots of physical media on hand in order to enjoy music, television shows or movies – it’s all on demand. 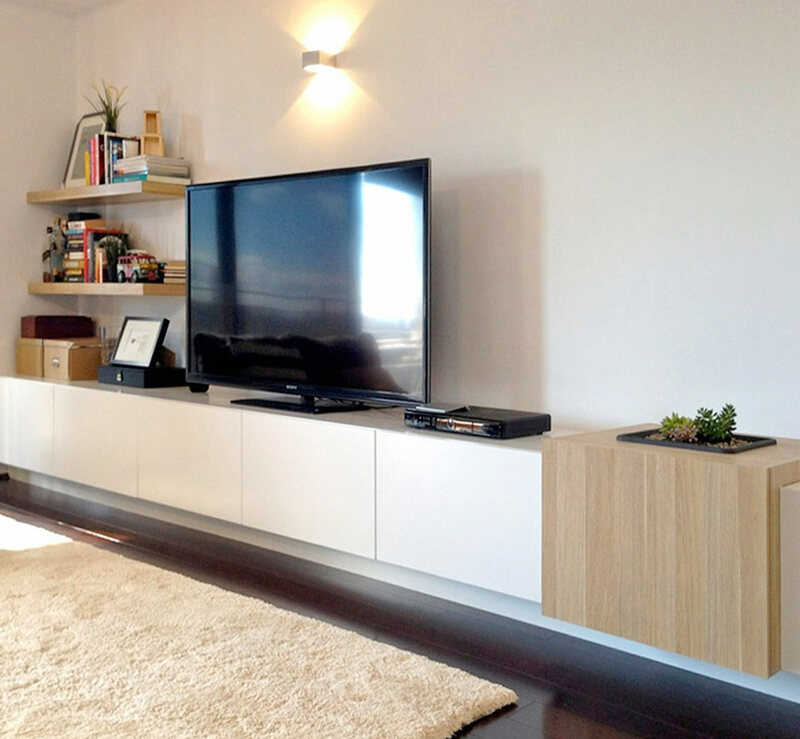 Just as the technology that keeps us entertained has evolved, so have TV units in Sydney – they’re now sleeker, lighter and able to meet the demands of your accessories. "We are extremely happy with the result and very happy with the service. We are definitely satisfed with the product." "My unit looks fabulous and has made a huge difference. I can't thank Spaceworks enough for their professionalism right from my first phone call through to installation - you have one very happy client and I have recommended you to everyone!" 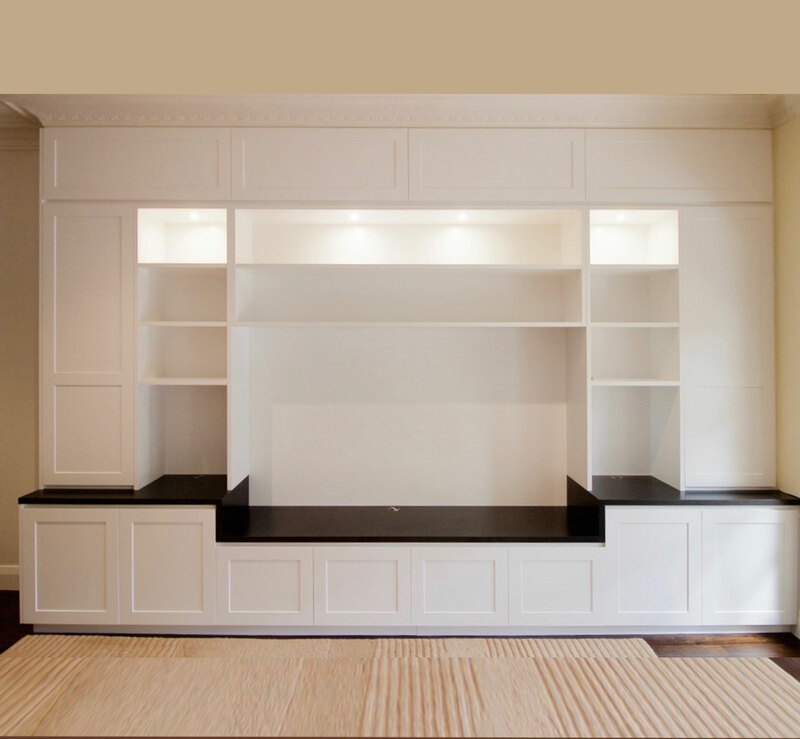 Whether you want to display your impressive DVD collection or hide it away from view, we can create custom entertainment units to match. Our design team will work closely with you to gain an understanding of how you intend to use the space, ensuring that the finished product is everything you wanted. "I am more than happy to recommend your company and hope you get work from my referrals. Visitors have been most impressed with the built-in entertainment area, so thank you." How is the media unit ventilated? There are several ways, the two most common are using a mesh screen to match your panel colour or cutting ventilation slots in bases, backs and tops in a way that they are hidden from view. A “flip-up” door can also be used. Can I control the media equipment inside the TV entertainment unit remotely? Yes, a mesh screen or a glass panel (clear or tinted) are commonly used. There are no hard rules here but generally, we do not do repairs or re-fits to existing cabinetry made by other cabinetmakers. What type of handles do you use? You can choose from a selection of handles in our showroom or from the websites of selected suppliers. Alternatively, if you can’t decide at the design stage, you can supply the handles and we will fit them for you. Routed or “shark-nose” handles are also often used. 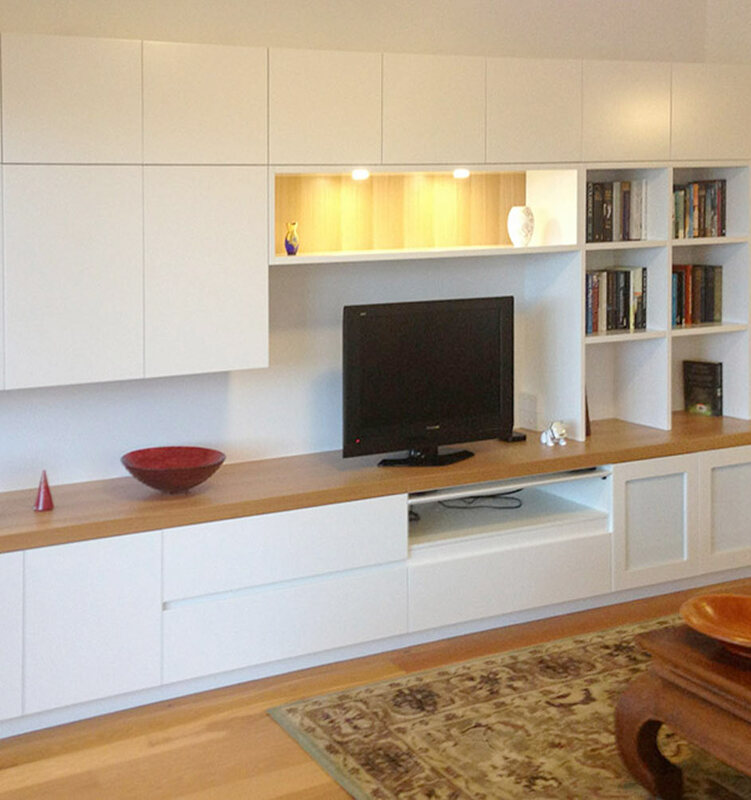 We provide custom made entertainment units to most areas of Sydney, including: Lower North Shore and Upper North Shore, Northern Beaches, Inner West, Eastern Suburbs and more. Suburbs such as North Sydney, Lane Cove, Chatswood, Wahroonga, Mosman, Seaforth, Freshwater, Rozelle, Newtown, Surry Hills, Strathfield, Woollahra, Waverley, Ryde, Castle Hill and many more. Please contact us to see if we service your area.